As a high school history teacher, I have a unique opportunity to help young people understand our democratic system and how it fits into the larger scheme of world politics. My tenth grade students have had very little exposure to international history prior to arriving in my classroom. They walk through my door with virtually no knowledge of the Industrial Revolution, the World Wars, the Cold War, or any notion of the various forms of government or philosophies tried, tested and sometimes failed in the past few centuries. Most have heard of Capitalism, but don’t really know what it means or why we call ourselves capitalist (and that, ironically, this is a misnomer). They do take history in middle school, but unless they have a natural inclination toward history, they forget most of it by the time they get to me. Now, before you get too judgmental I must ask you to do two things: First, ask yourself honestly if you enjoyed learning history in school (if you did, like me, we are rare!) Second, recall what was important to you when you were 15. Exactly. It is uniquely challenging to try to explain to students, most of whom, through no fault of their own, couldn’t care less. 15 year olds are not fully equipped to be concerned with other people from another time… they barely have the energy to care about anyone other than themselves most of the time.. And I say this as a loving mother and teacher. It is where they are developmentally. I get it. On a daily basis, I try to figure out how to translate my passion for connecting past to present to my students. So, when the 2016 election was over last month, at least I had their attention! This they cared about. Walking the fine line of facilitating discussion that is open to all opinions, modeling respectful ways to disagree, and encouraging some students not to despair and others not to gloat, all while keeping my own views out of the discussion was exhilarating. As I allowed for differences of opinion to be expressed, I gently guided the discussion to the larger picture of our democratic system, and the role our country has had in world affairs since 1945, while helping them connect the dots from the decolonization of the globe and the push toward democratization, and how that has been a challenge from the start. Most countries are not democracies. And only ours, France’s and Britain’s had stood the test of a relatively short time by 1945. I wanted them to see how fragile democracy can be and to have them feel how important it is for us to come together as a nation. It won’t be easy and it won’t be instantaneous. 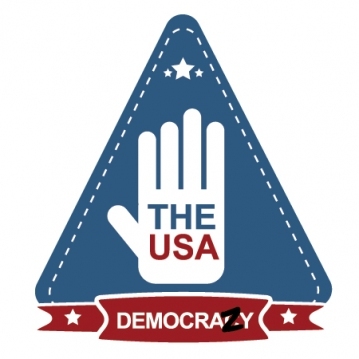 But the more people understand the importance of mutual respect and trust in the democratic process, the less likely the nondemocratic voyeurs around the world will get their wish: to see American democracy be the very thing that tears us apart. I titled this month’s column ‘Democrazy’ because it can make us feel that way when we lose sight of the bigger picture. Freedom of speech is a hallmark of democracy. Without it freedom does not exist. But with it comes the right to say some crazy things! It is the job of every citizen to weed out the crazy and seek truth and common ground. I am reminded of Winston Churchill’s eloquent observation, “Democracy is the worst form of government…. except all the other forms that have been tried.” We have to recognize the value of our democratic system and work to keep it from tearing us apart or we will find ourselves with a worse replacement.